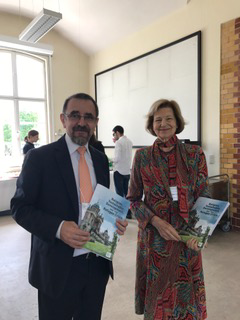 The following statement was issued by Dr. Liviu Olteanu after the Inaugural Session on: Religion, Sustainable Development and the Refugee Crisis that took place on May 15, 2017 at the G20 “Interfaith Summit” hosted at the University of Potsdam, Germany. The Secretary General of the AIDLR, Dr. Liviu Olteanu, had an exchange with H.E. Baroness Emma Nicholson from the House of Lords, UK, regarding her perspective as a member of the House of Lord on Religion, Sustainable Development, Refugees and its impact on Security; Baroness Nicholson was invited to cooperate with the International Association for the Defense of Religious Liberty on the Global Summit on Religion, Peace and Security and she shared her thanks for the copy of the journal, ‘Ambassadors for Liberty, Hope and Peace’ received from Dr. Olteanu on behalf of the AIDLR.